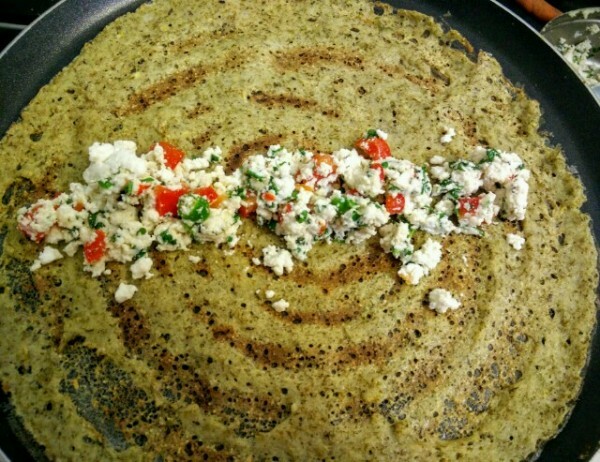 There are two ways of making these crepes, or as we in India call it dosa. It’s either instant, or its fermented overnight. I’ve made the fermented kind here, but have included a recipe for the instant kind too. I’ve stirred up two chutney’s to go with the meal. It’s the first time I’ve used seeds–pumpkin, watermelon, flax, sesame, chai and sunflower–in my green chutney, and trust me the flavours only get better. 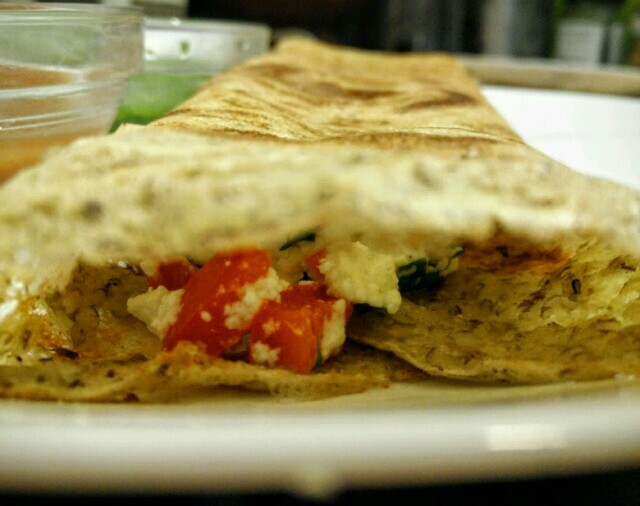 The only problem with a dosa, is that it needs to be consumed immediately or it goes soft. This recipe is a diabetic friendly version, and has no rice or rice flakes. If you don’t mind consuming grains with a higher GI, you could add a cup full of beaten, soaked rice flakes to the mixture just before you’re ready to cook it. 2. Add salt, cracked pepper and stir up the batter. If your batter isn’t sour enough, squeeze the juice of one lime. 3. Heat up the skillet or girdle or dosa pan. Add a drop of oil. Cut up a potato into half and stick it into a fork. Use the flat side of the potato to spread the oil all across the hot pan. 3. Drop a big spoonful of the batter in the centre of the pan, using the back of a flat spoon to spread the batter all over the pan. Use circular motion to spread the batter. 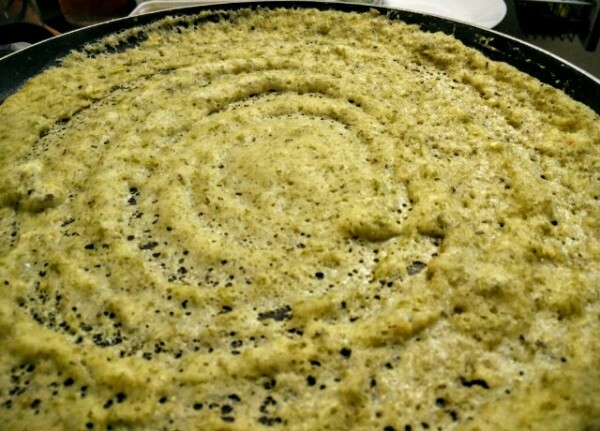 Since we are using green gram, you may not get a really thin crepe. 4. Once the top is dry, place a straight line of the stuffing running across the centre. 5. Roll the two sides inwards and your crepe is ready to be served. Simple and easy to make, the stuffing can also be rolled into croquettes too, dipped into breadcrumbs and beaten egg and shallow fried! 6. 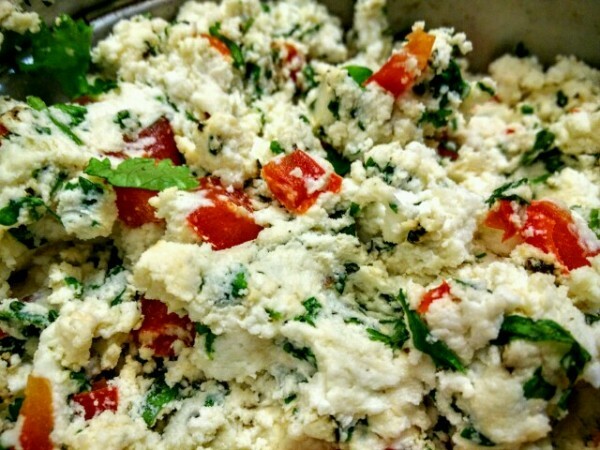 Simply mash up the cottage cheese, and add the coriander seeds, bell pepper, coriander leaves and salt and pepper to it. It needs no cooking at all. 1. Blend all the ingredients together. Add salt as per taste. Squeeze the lime and serve.